Walking the streets of San Francisco with camera in hand, I was on the lookout for cityscapes, abstracts, candids and perhaps an interesting angle on one of the city's iconic cable cars. With all this in mind, I was travelling light, just one camera body and a mid range zoom lens. In a variation of Murphy's Law it was a case of "the lens you leave back in your hotel room is the one you end up wishing you had with you" as a scene presented itself which really demanded a telephoto lens. 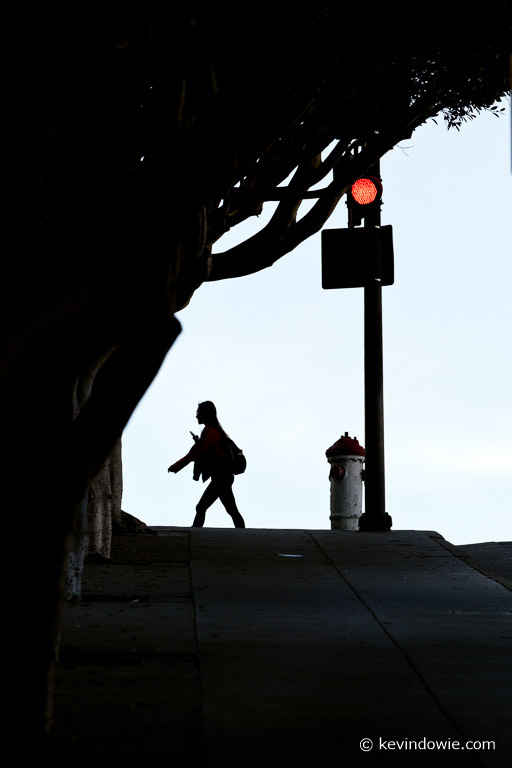 Standing on a street corner, I looked up one of San Francisco's famous hills to see some people walking along the footpath towards the pedestrian crossing. Because of my low angle from the bottom of the hill, they had the sky as background. It was at this time that a man walked by wearing the classic cowboy or "ten gallon" hat. Recognizing the value of such a distinctive shape, my immediate thought was, "if only I had my longer lens, this would make a killer silhouette". My second thought was, "I've got enough time to come back to the same spot, appropriately equipped, with the specific objective of getting some interesting silhouettes". Who knows? If I'm lucky, the guy in the cowboy hat may be a local resident and walk the route on a regular basis! The following day I set out with the 100-400mm zoom returning to the same loction. I've written before about the "fisherman vs hunter" mentality when seeking images, this was the classic fishing expedition where the location effectively becomes a stage and we wait for the actors to enter. I believe the key to an effective silhouette is a simple, readily recognizable shape. With my subject being people, a dynamic pose or body position would be a bonus as would some other simple and clear element. I longed for someone walking a dog on a leash, someone pushing a shopping trolley, someone riding a skateboard or bicycle, or, of course, the man in the huge hat! Below, not quite the ten gallon hat but I liked the single figure silhouetted against the sky. The camera was set to manual exposure and metered +2 stops off the sky leaving it close to the extreme right side of the histogram. There is some detail in the shadows but pushing the black point during processing darkened the already dark tones. How dark did I wish to make those tones? I was happy to leave the fire hydrant and some detail in the tree trunks whilst the remaining details in the man's face are only really perceptible when viewed very closely. I guess this raises another point. Unless you push all the lower values to pure black, our perceptions of the image will depend on the scale of reproduction, a different processing may be required if producing a larger print to preserve the same feeling as a smaller print. In the next image I was pleased with the posture of the young woman striding out with her arm extended, a dynamic pose. This was one of several images with the camera in burst mode. Purposeful stride. Young woman with mobile device, San Francisco, USA. With the next frame in the series, I decided in post processing to do a severe crop. The cropped image represents just under 4% of the full frame! I've included it here for two reasons. Firstly it's a simple graphic design and secondly because of the remarkable clarity of detail that is evident in such an extreme enlargement. The cropped file has enough data to create a high resolution print at at least 12x8 inches or 30x20 cms without interpolation, another reminder of the extraordinary capabilities of the modern digital camera. 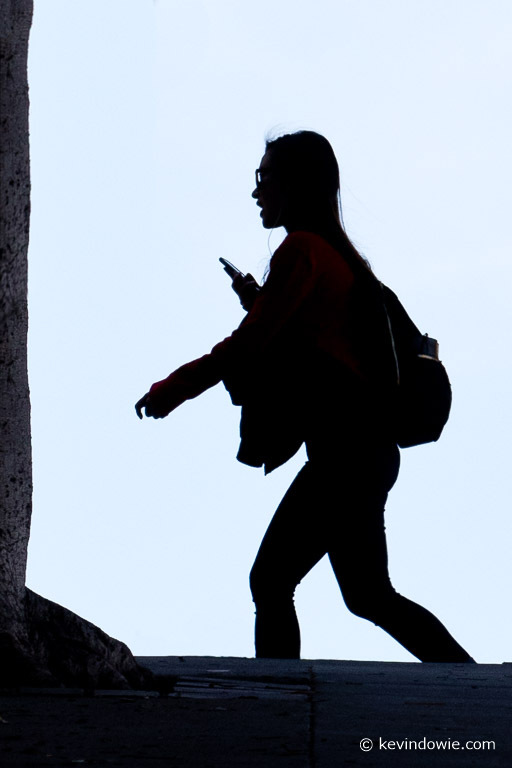 Young woman silhouetted crossing the street. Silhouette, San Francisco, USA. Finally not one but several people in the frame. The couple walking towards the camera and the young man with the bicycle moving laterally through the scene. I was mindful of getting good separation between the people using the traffic light post and the nearer traffic sign as compositional elements. I tried where-ever possible to use the single red light in the frame as the only obvious colour element. A couple, a man and a bicycle. 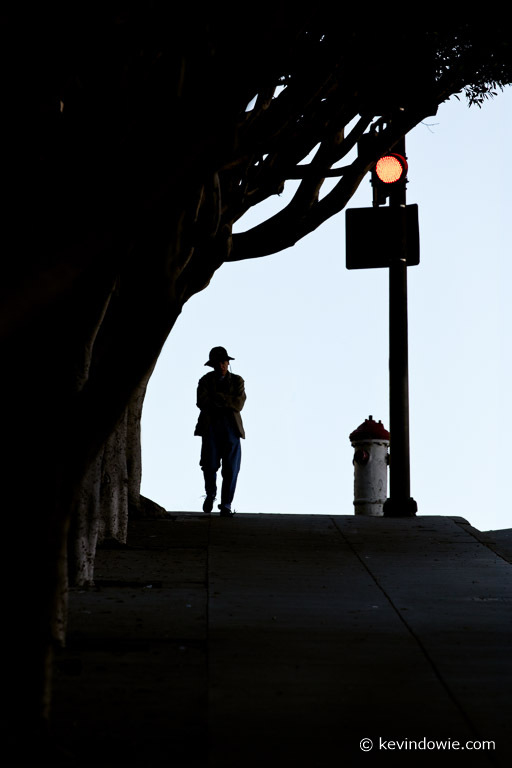 Street scene in silhouette, San Francisco, USA. In the end the man in the ten gallon hat did not make a repeat appearance (the fish that got away?) but I consider the exercise a success with several more interesting frames on the hard drive awaiting review.